Our vacation rentals feature new appliances, including a stainless steel refrigerator and oven, updated kitchen and bathroom cabinets, and large flat screen HD TV in the living room. Tile in the kitchen and living room. Open and spacious; light and bright all day. Large dining table and bar stool area. Newer carpet in bedrooms. 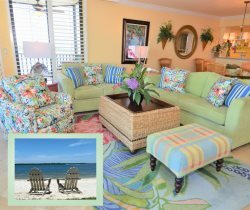 This Sanibel Harbour condo on the Gulf Shores has great views from the screened-in balcony and master bedroom. King bed in the master, a queen in the guest bedroom, and 2 twin inflatable air mattresses. You may have found this rental on HomeAway 4363836, HA ID 4363836, VRBO 4363836, or Vacation Rentals 4363836. Everyone was very friendly ad helpful on the phone before arrival as well as in person during our stay. From booking the apartment to our arrival and departure has always been flawless. When we needed anything their response was swift and efficient. We have been working with Kelly for the past four years and look forward to continuing working with her! Enjoyed our chats with Angelo at the open house too! Had a wonderful time. This is our fourth year staying on your property. Like a peace of heaven. We enjoy having the hotel next door and utilize the restaurant and poolside cafe. We have enjoyed the Ft. Myers area and continue to explore all year. The Sanibel Outlets are so convenient right near the property. The property is always very clean and well kept and the sand beach is kept very clean too. We plan to see you again next hear for a month long stay. We keep increasing our time there. We love the unit 734 that we rent. Thank you all .